"If you love double-crust white pizza, this sandwich will satisfy your craving without making a whole pizza or ordering out. Great served with a side of marinara sauce for dipping and wonderful with a hearty salad." Melt butter in a nonstick skillet over medium heat. Cook and stir onion until starting to brown, about 5 minutes. Transfer to a plate. Mix remaining 1 tablespoon butter, rosemary, onion powder, garlic powder, salt, and pepper in a small bowl. Spread on one side of each slice of bread. Place 1 slice of bread buttered-side down in the skillet. Top with onion, mozzarella cheese, American cheese, and provolone cheese. Cover with second slice of bread, buttered-side up. Cook until golden brown, about 3 minutes. Flip with a spatula; cook until second side is browned and cheeses are melted, about 3 minutes more. Use any bread or cheeses that you prefer. 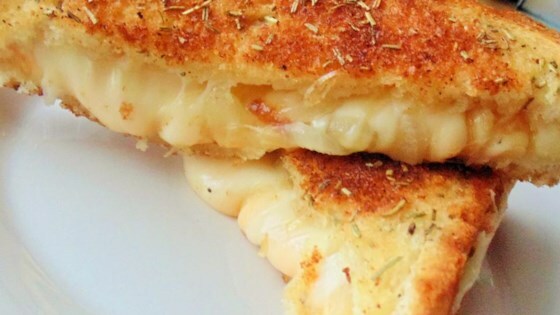 Good but really just a 3-cheese grilled cheese sandwich. Perhaps if it had some pepperoni mixed in? I didn't actually make it but I thought it was a pretty looking sandwich SMH Everybody just remember the old saying " if you can't say something nice don't say anything at all "
This was delicious! So much that my youngest came up and hugged and me and thanked me after tasting it! I couldn't find sharp American cheese, so substituted sharp cheddar. What a wonderful treat. Our family loves this and also the ability to "personalize" witth whatever is a "must" for their taste. Enjoy!